When you celebrate a landmark birthday you throw a big party, but what do you do with the presents? In Tennessee’s case, you turn the sites of those celebrations into places people will treasure for years to come. The Parthenon in Nashville was built as part of the state’s Centennial Exposition held in Nashville in 1897, a year after the state’s 100th birthday. Driving through Nashville’s West End, you’ll find the site of Tennessee’s Centennial Exposition. Held one year after the state’s 100th birthday, the event lasted six months and drew people from all over the world. At the end of the celebration most of the buildings were torn down, but the city’s love for the Parthenon kept it standing. Now, more than a hundred years after it was built, it’s difficult to imagine Nashville without it. A statue of John Thomas, the President of the Centennial Exposition. While the Parthenon is magnificent on the outside, what’s inside is perhaps even more spectacular. Standing more than 40 feet tall, a statue of the Greek goddess Athena watches over the expansive top floor of this majestic building. Athena who is adorned in gold leafing, holds a large shield by her side, and in the palm of her hand, Athena is holding Nike, the Greek goddess of Victory. Across town, the big present for the state’s Bicentennial comes in the form of a 19-acre park where a simple walk takes you through a billion years of the state’s history. Bicentennial Mall opened with great fanfare in 1996 in a star studded salute to 200-years of statehood. Situated at the bottom of Capitol Hill, this park packs quite a bit of features into a relatively small space. The Greek god Nike in the palm of Athena’s hand at the Parthenon in Nashville. The statue of Athena inside the Parthenon stands more than 40-feet high. Tall granite markers rise up on one side of the mall creating a history timeline. Between each of the markers you’ll find a smaller granite wall where specific historic facts are etched into the stone. 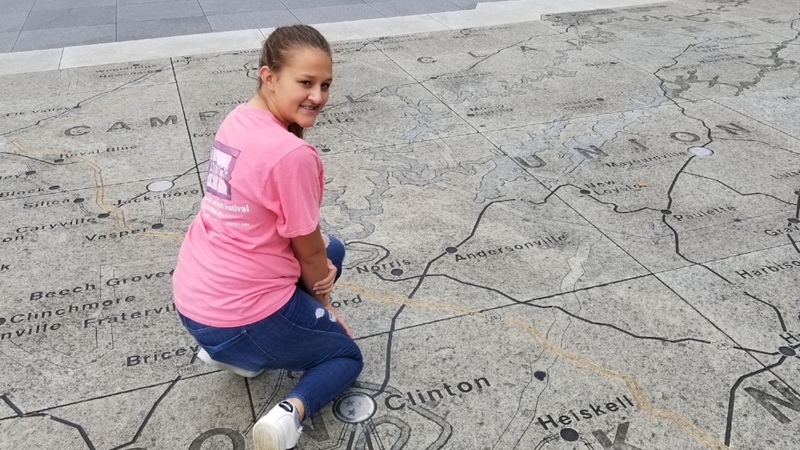 This stroll through history begins with a look at the state’s geology and a look at the first settlers in what would become Tennessee. A prominent break in the wall is where you’ll find information about the Civil War and how it affected the state. Another unique fixture is a large globe floating in water. In this section, you’ll learn about Tennessee’s role in World War II, a story which includes the state’s “Secret City” of Oak Ridge a city built as part of the Manhattan Project. Closer to the State Capitol you’ll find two other amazing features starting with the plaza next to James Robertson Parkway. A larger than life map of Tennessee shows each County Seat, the state’s major roads and rivers, and helps you better understand the geography of the state from the Smoky Mountains to the Mississippi River. At night, a light is turned on where each County Seat is on the map. Just behind the plaza on the other side of the train trestle a series of fountains represents each of the state’s major rivers. This is a popular spot for cooling off on hot summer days. Plenty of Tennessee State Flags fly on either side of the fountains and in the middle of Bicentennial Mall is an amphitheater. At the opposite end, another plaza with three stars is surrounded by a carillon made up of 95 bells that play music at different times throughout the day. The Tennessee State Museum is now housed in this building on Bicentennial Mall. The new Tennessee State Museum is located on Bicentennial Mall near the Carillon and about halfway down the Mall is the Nashville Farmer’s Market, a great place to shop and to eat. The Tennessee State Capitol is also close enough to include in your visit to this grand birthday present.